In World War II the United States faced the greatest administrative test since its founding. The Government took millions of men from their homes for the armed services, prescribed how much food the housewife might buy, determined how much and what kinds of goods were to be produced by its mightiest corporations, and went far toward deciding just where a man might work and what he might receive for his labor. Yet it managed to do these dictatorial things within the framework of the democratic system, and even in the forms and changes of its administrative machinery it preserved the methods of democracy so that the resolutions of tensions proceeded, if not always smoothly, yet directly and firmly. Modern war is not merely a battle or succession of battles between groups of fighting men. A fighting army is only the cutting edge of a militarized industrial system. A nation's fighting strength depends on how well and to what extent its entire resources have been mobilized and managed toward the ends of war. To accomplish this mobilization and management a government adapted to the needs of peace must be enlarged and reorganized so that it can assume enormous tasks foreign to its traditions. New department, new agencies, new offices must be organized and staffed. Policies must be hammered out in unaccustomed areas. In the process the most complex and delicate problems in government and public administration have to be solved. Problems of wartime administration are not simply problems of the mechanics and procedures of government. The objectives of government, even in time of war, are often in warm dispute and the building of administrative mechanisms must proceed with great urgency in an atmosphere of conflict about what the objectives should be. The evaluation and leadership of public opinion occupies a position of no less significance than administrative expertness. In the American democracy, a government, no matter how wise its judgment may be, cannot for long execute its will arbitrarily against the opposition of substantial blocs of opinion. It must educate, placate, temporize, and act boldly as conditions require. Governmental action on questions of administration, like action on other questions, must proceed within a changing context of public opinion which limits and influences what may be done and may govern the timing of decision. well before December 7, 1941, with the first of the Axis challenges to the democratic system and with the first halting actions taken in the face of strong democratic opposition which stemmed from a general disbelief in the possibility of war. When the Japanese entered Manchuria, we were indifferent; when the Germans marched into the Rhineland, we were startled--but our first attempts at action were negative; we were still trying to stay out of war. Finally, in the two years of 1939 and 1940, we made up our national mind in a great period of national debate. We made up our mind and recast our thinking about national protection with all the creaks and groans, charges and coutnercharges, exaggerations and vitriol characteristic of discussion under the democratic process. Hindsight makes it clear that we could have done better to act more promptly. On the other hand, the Government pursued firmly a course toward strengthening the national defense, and it moved about as rapidly as national consent was obtainable. Each great issue was discussed until it became clear that the proposed line of action was in accord with the wishes and the judgment of a majority of the people. In all these issues we had to deal with unprecedented situations and it took time to make up our minds. it took time to grasp the fact that nations could and would attack ruthlessly and suddenly, without warning and in violation of the traditional rules of war and our notions of fair play. It took some reflection to see that a war on the other side of the world affected us. That we were able to settle these questions without serious internal dissension was not a surprise to those with faith in the democratic tradition, but it could not have been done without intelligent leadership nor did the Axis strategists believe that we could do it at all. Their miscalculation was that they believed that internal conflict--between capital and labor, between farmer and city dweller, between white and black--would paralyze the United States, especially if the conflicts were encouraged by deftly managed propaganda under Nazi guidance. Authoritarian nations were unable to understand how we could engage in the most exaggerated debate involving recriminations, picturesque and fantastic charges, appeals to prejudice, incitements to hatred, and insinuations of treason with tearing ourselves asunder. That we could determine to act, and to act in union, by such a process was beyond the comprehension of those unschooled in democratic practices and was, perhaps, the most significant factor in our mobilization for the war. If history has any lessons, the lesson of the period from 1931 to 1939--from the Japanese movement into Manchuria to the German invasion of Poland--is not to be found in what we did but in what we did not do. Throughout this period opposing factions contended over what the foreign policy of the United States should be. The limited commitments which the Nation was disposed to undertake in foreign affairs created no need for important steps in the mobilization of Government for the contingency of war. The important question we had to decide was whether wars elsewhere in the world were of any concern to us and if so, what we proposed to do about it. The decisions taken on these issued demanded no substantial alteration of the governmental system. Only a few actions were taken of subsequent significance for governmental organization. In the years preceding September 1939, when Germany invaded Poland, we were more inclined to feel annoyance with the march of events in Europe than to consider seriously their implications to us. Our own domestic problems were difficult and persistent and we did not welcome distractions from our efforts to solve them. As far as most of us were concerned, both Europe and Asia should be left to solve their own problems in their own ways. We found refuge in the hope that minor changes would soon produce new political equilibria. There were few who would have given credence to the suggestion that what appeared to be irresponsible minorities in Germany and Japan could eventually drive us into the maelstrom of world conflict. Before the Neutrality Act of 1935 there were a few forecasts--penetrating but largely unheeded--of things to come. The Japanese movement into Manchuria in 1931 began a chain of events which were to bring us into war. 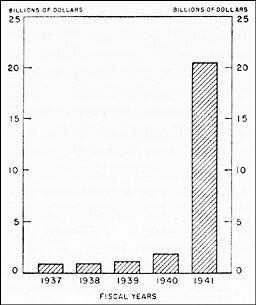 While in sentiment the people of the United States condemned Japanese aggression, the strongest feasible governmental policy was the doctrine of nonrecognition pronounced by Henry L. Stimson, then Secretary of State, who correctly gauged the ultimate significance of the new Japanese imperialism. Similarly, most of us were slow to recognize the potentialities of the New Germany. Soon after the accession fo the Nazis to power, some of our diplomatic observers saw in the new government a serious threat to the peace of the world. A prescient dispatch from Berlin in April 1934 informed the Secretary of State that the fundamental purpose of the Nazis was "to secure a greater share of the world's future for the Germans, the expansion of German territory, and growth of the German race until it constitutes the largest and most powerful nation in the world, and ultimately, according to some Nazi leaders, until it dominates the entire globe. "1 The Nazis, the same observer reported "are determined to secure more power and territory in Europe." Our deep aversion to war, joined with the notion that wars are fought to protect profits, led to the Neutrality Act of 1935 and its successor acts. The theory was that if we did no business in munitions with nations at war, our commercial interests would not become involved and we would not be brought to fight to protect them. If American vessels stayed out of danger zones and were not sunk, we would not become angry because they had been attacked. The Act, approved August 31, 1935,6 made it "unlawful to export arms, ammunition, or implements of war" from the United States for the use of the countries at war when the existence of war had been proclaimed by the President. The law also made it illegal for munitions to be transported to any country at war on American vessels, empowered the President to regulate access of submarines of foreign nations to American waters and ports, and forbade United States citizens to travel on the vessels of belligerent nations when the President proclaimed that such abstention would promote the maintenance of peace. The Neutrality Act of 19376 did not restrain Japanese aggression in China. In July 1937 the Marco Polo Bridge incident occurred and a large-scale Japanese movement into China was soon under way. To apply the terms of the Neutrality Act to the Sino-Japanese conflict would deprive the Chinese as well as the Japanese of munitions and materials of war. Shipments to one could not be embargoed without stopping the movement of goods to the other. The act did not become operative until the President should, in the words of the statute, "find that there exists a state of war between, or among, two or more foreign states. . . ." No such finding was made and goods continued to flow to both China and Japan. While undeclared war went on in China and the Spanish civil war continued, the President made his notable "quarantine" address in Chicago on October 6, 1937. He remarked that the world political situation was "growing progressively worse." It was such as to :cause grave concern and anxiety." He cited interference by nations in the affairs of others, the ruthless murder of civilians by bombing, the sinking of ships without cause. He thought the "very foundations of civilization" were seriously threatened." He warned that we should not "imagine that American will escape" if the rest of the world became embroiled. The peace-loving nations, he declared, "must make a concerted effort to uphold laws and principles on which alone peace can rest secure." He saw a spreading "epidemic of world lawlessness." He observed that when epidemics of disease spread, "the community approves and joins in a quarantine of the patents in order to protect the health of the community against the spread of the disease." He thought that the will of peace-loving nations had to be expressed "to the end that nations that may be tempted to violate their agreements and the rights of others will desist from such a cause." The speech brought charges of "war mongering" from many sources, charges that were made at the time when the League of Nations was attempting futilely to end the undeclared war in the Far East. Nor was our complacency much disturbed by outright attack on American vessels, the Japanese bombing in December if the United States gunboat Panay and three United States merchant vessels on the Yangtze. The United States Government immediately initiated the appropriate diplomatic demand for apology and for indemnification, a demand which was promptly met. ye the larger significance of the affair in the general sequence of events seemed to escape us. All these developments in foreign relations did not occupy the center of the stage in American politics. Public interest and the major part of the efforts of the Government had since 1933 be concentrated on problems of domestic recovery and reform. The measures taken at the time of the inauguration of the new Administration in 1933 demanded almost the complete attention of the public and required a greater part of the effort of the Government. These emergency programs, and discussions over fundamental measures of domestic reform overshadowed the threats to peace. Our traditional spirit of nonparticipation in the affairs of other parts of the world was thus fortuitously reenforced by the course of domestic politics. Only as the world crisis approached its climax were we able to begin to mobilize our national opinion on foreign matters and to begin to realize that we had a vital stake in the events outside our boundaries. As the threats to world peace became more apparent, it became feasible to initiate a few measures of rearmament. Yet even limited measures of preparedness aroused non little opposition. In only one phase of defense preparation was it possible to proceed without having to overcome the charge of war mongering. The Merchant Marine Act of 1936 had laid the basis for a long-range program for the rebuilding and enlargement of the Merchant Marine. The Maritime Commission, in consultation with the Navy Department, developed a program for the construction of merchant vessels designed incidentally to meed defense requirements. In 1938, 37 ships were under construction for the Maritime Commission in addition to ships being built for private operators who were taking advantage of the subsidy plan provided by the Act of 1936. In the following year, 1939, the program was accelerated to compress into 2 years the previous 3-year program. 3, 1938, the President said that it had become clear "that acts and policies of nations in other parts of the world have far-reaching effects not only upon their immediate neighbors but also on us." He observed that in "a world where stable civilization is actually threatened" a nation striving for peace had "to be strong enough to assure the observance of those fundamentals of peaceful solution of conflicts which are the only ultimate basis for orderly existence." A few weeks later he recommended some increase in both naval and land arms. "In the light of the increasing armaments of other nations," he found it his constitutional duty to report that our national defense was "inadequate for purposes of national security" and required "increase for that reason." The modest recommendations by the President were adopted in substance by the Congress only after long discussion. The congressional hearings on the bill to authorize an increase of approximately 20 percent in the combat strength of the Navy indicated the beliefs of those who opposed greater preparedness. One type of belief was that "a wholly abnormal naval building program" would "intensify international tensions and distrust." Others opposed increasing the Navy "until the American people know what lies behind the increase and what is our present foreign policy" Another view was that the American people ought to know what "our Government would do if an undeclared war broke out in Europe." Others believed that the President had "set out on the road to collective action or quarantine that leads to war." The parade of witnesses before the congressional committees reflected the views, fears, and questions of many citizens. 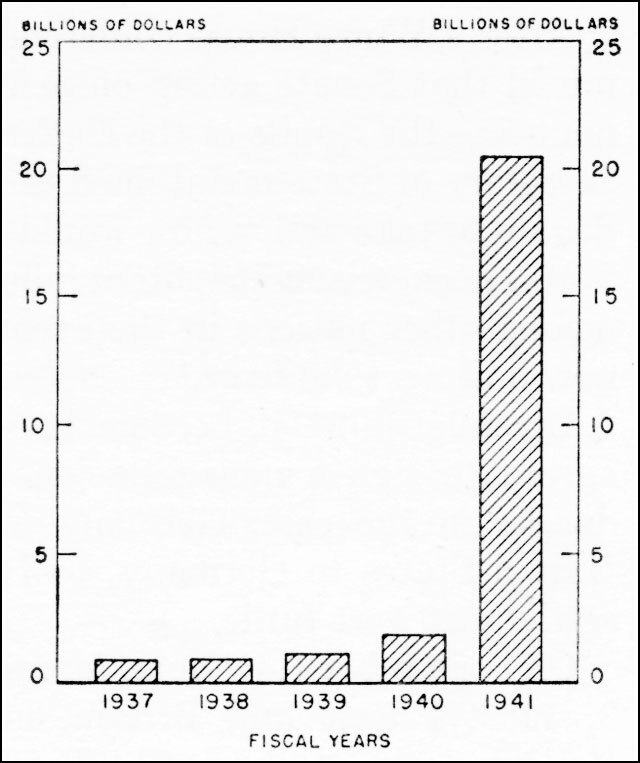 While discussion on the naval expansion bill proceeded, the Nazis annexed Austria, and thus destroyed the strategic foundation for the existence of Czechoslovakia. The naval expansion provisions were finally adopted by the House of Representatives on March 21, 1938, by a vote of 294 to 100. The Senate acted on May 3 by a vote of 56 to 28.11 The recommendations for increases in Army strength were carried out in the military appropriation bills. During the summer of 1938, a war fever spread over Europe; it arose from fears about the intentions of a rearmed Germany. In all the countries bordering Germany, preparations for defense were accelerated and a general belief existed that war was imminent. During the Munich crisis in the summer and fall of 1938, the President urged the governments concerned to seek a peaceful solution. He predicted that hostilities would cause the loss of millions of lives. At Munich, Britain and France agreed to the Nazi demand for the Sudetentland. Statesmen, realizing the gravity of their surrender, were amazed to find themselves hailed by their peoples as saviors. Hitler's antidemocratic strategy was working. Britain and France decided not to fight. Nor had Hitler any reason to suppose that the United States could or would oppose him in the near future. Meanwhile, the Japanese conquest of China continued; our policy of nonrecognition of forced territorial changes and our efforts at persuasion appeared to restrain the Nipponese but little. In the summer of 1938 the Secretary of State requested a moral embargo by airplane manufacturers on the shipment of planes to countries which engaged in the bombing of civilian populations. Japan met these specifications and most shipments of planes soon stopped. In December the Export-Import Bank granted a loan of $25,000,000 to China to be used for the purchase of nonmunitions such as trucks, tires, gasoline, and machinery. At about the same time, Great Britain and the Soviet Union entered into agreements to furnish credit and supplies to the Chinese. It was not easy to believe that the Munich agreement held promise for the maintenance of peace. In his annual message to the Congress on January 4, 1939, the President reported that it was "increasingly clear that world peace is not assured." "All about us," he said, "are threats of new aggression--military and economic." He declared that religion, democracy, and good faith were challenged by "storms from abroad. . . . There comes a time in the affairs of men when they must prepare to defend, not their homes alone, but the tenets of faith and humanity on which their churches, their governments, and their very civilization are founded." He said that we had learned that "the probability of attack is mightily decreased by the assurance of an ever ready defense." Mussolini invaded Albania. The crisis atmosphere of the preceding summer again prevailed. The Government of the United States again appealed to Hitler and Mussolini for the maintenance of peace. CHART 1. Federal Appropriations for Defense Prior to Pearl Harbor. of the outbreak of war. "17 The Senate Committee on Foreign Relations on july 11 decided by a narrow margin to take no acton on neutrality legislation until the following January. On July 14, the President again urged Congress to act. He transmitted with his request a statement by the Secretary of State, who asserted that the arms embargo "plays into the hands of those nations which have taken the lead in building up their fighting power." An aggressor nation well prepared for war would be encourage din its depredations because it would know that "its less well-prepared opponents would be shut of from" supplies from neutrals. On August 21 it became known that Russia and Germany had agreed to sign a nonaggression treaty. Believing herself free from danger in the east, Germany was able to move. Appeals by the united States to Germany, to Italy, and Poland to seek a peaceful settlement were futile. On September 1, German forces moved into Poland. On September 3, 1939, France and Britain in fulfillment of their guarantees to Poland, declared war on the Reich. The role which the Government played in attempting to stave off war in itself placed no unusual requirements on the machinery of administration. Diplomatic maneuvers and limited preparedness could be carried on by the existing departments and agencies. Important steps in administrative reorganization were taken, however, and considerable progress was made in the practice of Federal administration. These changes were not made in preparation for war, but they stood us in good stead when war came. Like improvements in public health, in public education, in public highways, and in other services, improvements in public administration to meet the needs of peace strengthened us for defense and war. In January 1937, the President transmitted to Congress a message on the reorganization of the executive branch of the Government. He urged the adoption of a reorganization program in a message pointedly relating the matter of effective administration to national defense. "In these troubled years of world history," he said, "a self-government cannot long survive unless that government is an effective and efficient agency to serve mankind and carry out the will of the Nation. A government without good management is a house builded on sand." While democracy was being challenged by the temporarily triumphant doctrines of dictatorship, he asked, "Will it be said 'Democracy was a great dream, but it could not do the job?' Or shall we here and now, without further delay, make it our business to see that our American democracy is made efficient so that it will do the job that is required of it by the events of our time." After a delay of 2 years, the Reorganization Act of 1939 was adopted. It embodied only a part of the President's program of 1937. Under its procedures, the President with the approval of Congress, reassigned certain Government functions among the departments and agencies so that the number of agencies would be reduced and more efficient operation of the departments would result. The reduction in the number of agencies brought the governmental machine more nearly within the limits of control and direction by the President, even though certain important activities of the Government could not be touched under the authorizing statue. Other actions in the reorganization program contributed even more to strengthening the President as manager of Federal Administration. The reorganization plan brought into being the Executive Office of the President in recognition of the growing burdens upon the President and of the increasing necessity that he be adequately equipped to exercise leadership and direction of the work of the Government as a whole. In this officer were grouped the Bureau of the Budget, the National Resources Planning Board, the Office of Government Reports, the Liaison Office for Personnel Management, and the immediate White House Office. At the same time, the activities of the Bureau of the Budget were substantially enlarged to include the conduct of research "in the development of improved plans of administrative management" and advice to the President with regard to such matters. As the activities of the Executive Office were built up, the President came to be more nearly equipped with the machinery by which he could give the Federal Government the administrative flexibility essential in time of crisis. accompanying the Executive order noted that in periods of emergency it had "always been found necessary to establish administrative machinery in addition to that required for the normal work of the Government. Set up in a time of stress, these special facilities sometimes have worked at cross-purposes both within themselves and with the regular departments and agencies. In order that the Nation may not again be caught unaware, adequate resources for management should be provided in advance of such periods of emergency." The provision of the Executive order was eventually to serve as one of the legal bases for the erection of the major part of the governmental machinery essential for defense and war. It was a valuable feature in that it permitted the Government ot act promptly in time of emergency. In other ways the foundations of administration were being strengthened. in the thirties, thousands of highly trained persons streamed into the civil service to perform the duties required by legislation enacted to meet the emergency requirements of peace. A major element in the program of administrative management of the President was the strengthening and extension of the merit system of employment in the public service. The result was that when the need came, the most competent corps of civil employees in the recent history of the Federal Government was available for utilization on emergency tasks. These civil servants were, of course, inadequate in number for the work which was to come, but the rapid infiltration of persons of talent into the civil service strengthened it for the test of war. On the military side, during the thirties, the [Joint] Army and Navy Munitions Board, proceeding independently, prepared successive revisions of its Industrial Mobilization Plan. Revisions were issued in 1931, 1933, 1936, and 1939. In August 1939, the Assistant Secretary of War appointed a War Resources Board to advise on further revision of the Industrial Mobilization Plan. This board consisted of Edward R. Stettinius, Jr., Karl. T. Compton, Walter S. Gifford, Harold G. Moulton, John Lee Pratt, Robert E. Wood, and John Hancock. The Board reviewed the plan and submitted recommendations and suggestions. Shortly after the completion of its assignment, the Board was disbanded. 1. U.S Department of State, Peace and War, Washington, D.C.; Government Printing Office, 1942, pp. 211-212. 7. Roosevelt, Franklin D. The Public Papers and Addresses of ... New York: Random House, 1938. Vol. 4, 1935, pp. 345-346. 8. In October 1935, the American Institute of Public Opinion asked: "If one foreign nation insists upon attacking another, should the United States join with other nations to compel it to stop?" The replies were" Yes, 28 percent; no, 67 percent; no opinion, 5 percent. Of the 28 percent who favored our joining with others to check an aggressor, 65 percent favored economic and nonmilitary measures only, 31 percent were for military measures, if necessary; and 4 percent had no opinion on the issue. 9. In December 1936, the American Institute of Public Opinion asked: "If there is another general European war, do you believe the United States can stay out?" The replies were Yes, 60 percent; no 36 percent; don't know, 4 percent. 11. In May 1937, the AIPO conducted a poll on the following question: "Are your sympathies with either side in the present Spanish Civil War?" Twenty-one percent replied, "Yes," while 79 percent were recorded as saying "No" or "Don't know enough about it." 12. Congressional Record, vol. 83, pt. 4, p. 3767; pt. 6, p. 6135. 13. Roosevelt, Franklin D., op. cit., 1939 vol., pp. 70-74. 14. Congressional Record, Vol. 84, pt. 8, p. 8508. 15. Congressional Record, Vol. 84, pt. 8, p. 8498. 16. Congressional Record, Vol. 84, pt. 8, p. 8511.